I was fortunate enough to join Constant Contact in the early days, (before the email marketing industry “crossed the chasm“) and spent 10+ years inside the tornado it would become. 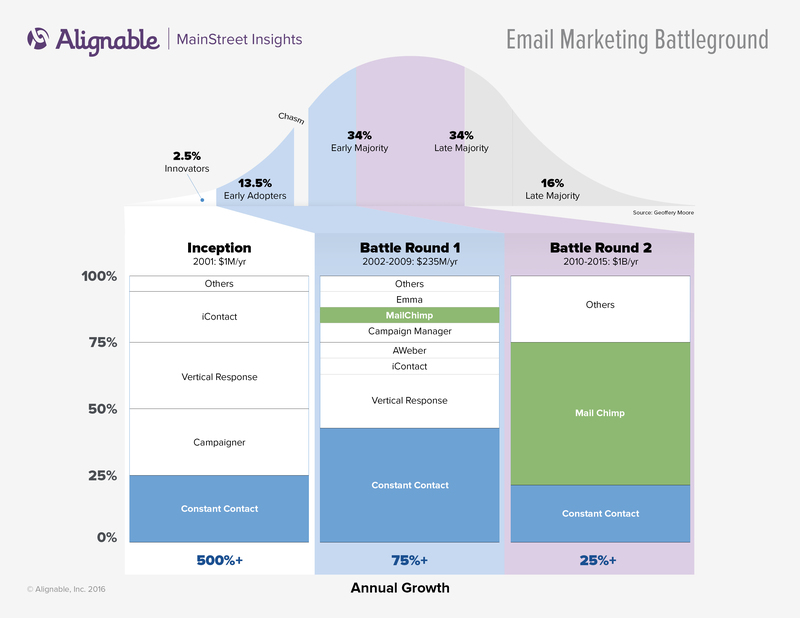 Since moving on and launching Alignable, I’ve continued to watch the evolution of SMB email marketing with a close eye. So when I read Constant Contact’s recent announcement that it would be acquired by EIG, it got me reflecting on the past 15 years and how much the industry’s evolution has taught me about what it takes to effectively sell to small and medium-sized businesses (SMBs). I joined Constant Contact in 2001 at a time when SaaS was called ASP and when SMB email marketing didn’t exist. Constant Contact had 10 customers, $100 in monthly revenue, and about 20% market share. We had no way of knowing when the land rush would commence, but we knew we were going to fight our way to the front of the pack as Battle Round One commenced. Maximized Trials — Constant Contact decided to offer a free 60-day trial while the competition offered only 30 days. Why did this matter? Small Business Owners (SBOs) saw 30 days as not enough time to make a decision about email marketing and 60 days seemed like more than enough time. In reality, the majority of conversions happened in the first week. Calling Trials Resulted in Three Times the Conversion — The simple act of reaching out to new users to let them know there was a real business behind the website (whether connecting live or leaving a message) tripled sales conversion rates. Education Doubles Conversion — When a trial customer attended an educational webinar or live seminar about how to succeed with email marketing, the sales conversion rate approximately doubled. Established Channel Partners — Associating with established SMB brands provided Constant Contact with a beachhead from which to launch its initial growth. Early success with partners paved the way for paid acquisition through traditional and online media. Toll-free telephone number — Giving small businesses access to free customer support via a toll-free number made them feel more comfortable in trying something new. For instance, Constant Contact regularly increased the display size of their toll-free phone number and increased its prominence on the website, while the competition removed their phone numbers all together. Pricing Structure — Constant Contact had a flat-fee, “send all you want” pricing structure, while the competition charged per email sent. The Constant Contact model attracted businesses and organizations that valued email and staying in touch to the platform. An imperative learning for SMB focused brands is that business owners don’t like not knowing what their bill is going to be at the end of the month. Hence, a variable pricing model will cause friction within the buying and commitment cycle. At the time, Constant Contact’s Net Promoter Score (NPS) was in the mid 30s, which seemed pretty solid at the time. As the industry matured into the later stages of the early majority, the market was growing significantly. A relative newcomer disrupted the market completely by offering a freemium product with no live support, and an attitude and voice that captured the attention of many. This masterful move by Ben Chestnut and the MailChimp team was the right move to totally disrupt the market at a time when it was going mainstream. So how did Mailchimp become the industry leader, when it was only a single-digit market player? Freemium Model — This enabled Mailchimp to capture the vast share of small business users of email marketing, while at the same time building a huge (7-million plus) pond of users who loved their product. As freemium users started to find success with Mailchimp, they would soon turn into paying customers. At the same time Mailchimp was executing this customer acquisition approach, the other providers in the market were using paid media to attract new customers. Additional “S” Curve — With the introduction of Mandrill, MailChimp leveraged their existing infrastructure to create a platform for large-scale mailers. While they didn’t need this additional revenue source to succeed, the process of building it out made their existing platform more scalable and automated. This new process was attractive to SMBs that were less “S” and more “M” focused, ready for something bigger. The Chimp’s Voice — To win over small business owners, a provider needs to be approachable, but as a freemium provider, MailChimp recognized early on they couldn’t scale with personal support due to cost. Instead, they opted for an incredibly well-written blog with great educational content sent out via email. The voice they used and continue to use today for all of these communications is uniquely theirs. It’s approachable, fun, educational, and embracing of the audience. Net Promoter Score currently 50 while Constant Contact is in the high teens. Constant Contact was recently acquired by Endurance International Group (EIG). Following the acquisition, the new leadership team gained access to EIG’s significant website customer base. This effectively provides Constant Contact with their own pond of prospective customers to pursue and engage. We’ll continue to track NPS independently to see how this latest change in strategy impacts small business owner sentiment towards Constant Contact. If people in your company find themselves saying: “it’s hard to sell to small business owners because they just don’t have the time to engage with us” you’re probably using the wrong approach to winning their trust and business. Think about how aggravated you get with that one person who calls you soliciting you at home. Local merchants are deluged with an average 17 calls and visits per month from people they don’t know, often trying to sell them something they don’t feel they need. Yikes. As we look through the reviews of brands with negatively trending NPS, the common themes often revolve around deceptive or aggressive sales tactics. Interestingly, both Constant Contact and MailChimp were able to capture industry-leading market share without hiring one outbound calling employee. During the formative stages of an industry you find the “right” strategy by moving fast and throwing a lot of things at the wall to find what sticks. MailChimp’s team and infrastructure enabled them to release and test new ideas quickly, many of which didn’t work. But they figured out what didn’t work quickly and moved on to the next test, rinse and repeat. Now with over 500 employees and 10MM customers they to need to continue to evolve in order to stay ahead of the game and avoid being disrupted themselves. Great piece! I had the great opportunity to work at Constant Contact from 2006 until last month and was part of the team that changed the game with education. I witnessed first hand an evolution of SMBs going from “new to tech” to adjusted and ready for more. Over that timeframe, it became important to keep beginner topics basic but to have golden nuggets woven throughout for those more tech savvy participants. The reality is that our content gold was in teaching marketing, not technology. And it was a dance, for sure, but it was exciting to see the steady shift in audiences and their expectations. I still believe very strongly in education as a marketing tool; edu-marketing. But on-demand options make it easier and more affordable to scale. Nothing beats an in person event for the relationship – but volume can win, especially if you’re seeking growth (Who isn’t?)) Distance learning is scalable. Tools like Alignable and Constant Contact make it easier to really engage with your followers and colleagues in an authentic way, at low to no cost. Education wins, yes. But scalable education wins bigger. Reach, teach and grow! Excellent points, Eric, think you nailed the broader evolution the email marketing category has gone through. As you look at where MailChimp has succeeded, it is worth noting that both iContact and Vertical Response tried to go freemium as well but both failed because they looked at giving away free software as a pricing strategy. MailChimp looked at it as a business strategy and build every aspect of their business model around it. They have executed the model better than any other freemium company out there, very impressive.